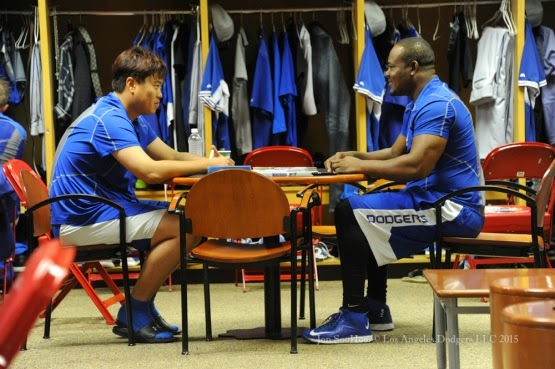 Hyun-Jin Ryu and Juan Uribe participated in what I can only assume was a legendary and contentious staring contest. As you certainly noticed, a sly grin can be seen on both, so maybe the strategy was to force the other to drop their guard - no doubt trying to get the other to fall over laughing. I wonder who won. Anybody know? On the other hand, maybe they're just playing domino's. Which isn't as cool as believing that these BFE's were playing the "blink game." Via Tim Brown at Yahoo Sports, "Albert Pujols' touching gesture for brother of Dodgers outfielder Joc Pederson." The Pedersons knew The Pujols Foundation, knew the work it did for people – children in particular – with Down syndrome and other disabilities. Champ did too. From that, they figured Pujols must be a good man. Champ is a pretty good judge of these things. "Champ's been wanting to meet him for a long time," Joc said. Jonah Keri at Grantland previews the 2015 Dodgers. Check it out here. It's excellent. by Tom Shieber at Baseball Researcher writes about, "John F. Kennedy and Baseball," and shares a copy of a letter sent to JFK from Jackie Robinson. Jackie's letter was scathing and critical of the President. Via Euno Lee at Los Angeles Eater, "What to Eat at LA's Dodger Stadium, 2015 Edition." Via Dave Golebiewski at Just a Bit Outside, "Let's get graphic: Grandal's offensive prowess." Awesome! Check out this GIF gallery of the swings and pitches of the some Baseball's most legendary players. Go here. I do miss Russell Martin as a Dodger, but I can certainly appreciate Montreal's native son (and Toronto for that matter) coming home to play ball. Below is a short video of his introduction before taking his first at-bat during the exhibition game at old Olympic Stadium this past Friday.